Wooden guitar plectrum. 3mm Ebony pick. Handcrafted in the UK. Buy one get one free! 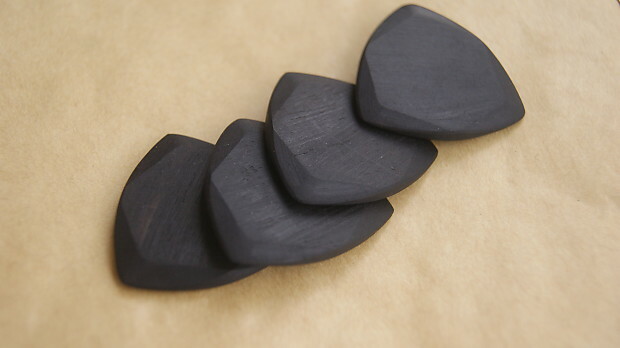 Handcrafted wooden guitar picks. Ebony 3mmx30mm. Price is for one pick only. Here's what customers have to say. . . Fantastic quality picks, a joy to pick up and use. They give a lovely warmth to an acoustic and a satisfying thump to an electric bass. Super quick delivery. Highly recommended. Thanks very much for sending the pics, they’re beautiful and totally excellent. As a bass player who has branched out into guitar I originally found pics to be completely alien and I struggled to keep hold of them. They would go flying off in all directions and as a result I ended up playing guitar with my fingers quite a lot. As this wasn’t the sound I was after it was rather frustrating. On a recommendation I tried using picks by an American company called ******* (hand made acrylic). At last, I’d found the thing I’d been looking for, a pick that didn’t fly out of my hand at the first opportunity. Having seen wooden picks I thought I’d give one a go. so, on searching a range of sites I spotted your pics on Reverb and decided that buying from a British maker was the thing to do. WOW!!! What a product you have!!! Your ebony picks have a virtually identical attack to a Gravity pick but they feel so much nicer, I love them!!! It only took a couple of minutes to get used to the difference and I’m really happy with them. I love the spring of the laburnum and the rosewood and cocobolo aren’t getting much of a look in YET!!! The ebony is perfect. Thanks for making these beautiful items. The picks are fantastic and thank you so much for including 2 extra ones with the order it's really appreciated. I've been using ****** ***** for quite sometime but these are in all honesty better. Each pick is a really nice size and has it's own distinctive tone. I'm going to have a good experiment with them over the weekend. Once again many thanks and I'll be back for more.